The HD142X is not a mold-breaking product, but its 8,000 hour lamp life guarantee, plus bright and accurate Full HD images make it a great value projector for adding a wow factor to the occasional gaming and movie nights. Bigger is almost always better in the world of home cinema, but most of us overlook a projector in favour of an ever bigger flatscreen TV. But, now selling for just $544 (UK£489/AU$1299), Optoma's bargain HD142X DLP projector might change that. It's not like our trepidation with projectors developed over night - in fact, there are good reasons why people tend to avoid a projector when setting-up a basement home cinema. One is resolution; while new TVs generally come with 4K resolution, only the most expensive projectors around do that. Not much has changed on that in recent years, and the Full HD1080p (1920x1080 pixels) resolution of the HD142X will put-off some. However, elsewhere the HD142X has got some tempting features that make it a standout in the terms of value. Its 3,000 ANSI lumens of brightness means it can be used in any ambient light conditions, so at any time of the day – this isn't just a movie machine after dark. Optoma says it will last for around 8,000 hours, which is about a decade if you watch a two-hour movie every day. That's one hurdle that the HD142X gets over, and it jumps another with its integrated 10W mono speaker. Okay, so that's not nearly as much power as your home theatre sound system, but unless the HD142X is destined for a bedroom or separate home theatre room, it's probably going to be enough for occasional gaming in a living area. 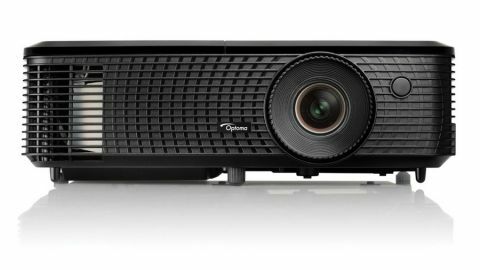 An affordable and compact DLP projector designed to be taken from a cupboard or drawer to create Full HD movies or games at a moment's notice, Optoma's HD142X will persuade many that flat panels are passé. To say that the Optoma HD142X's style is bland and uninteresting is a massive understatement, but that's projectors for you, and at least this DLP projector is reasonably small. Measuring 3.7 x 11.7 x 9 inches (386 x 162 x 280mm) and weighing 5.5 lbs (2.49kg), it's hardly super-light, but it's easy enough to hold under an arm and make a dash for the attic/bedroom/home theater den. At first glance it might appear rather barren on the back panel, however its two HDMI inputs (both HDMI 1.4a for MHL and 3D support) will be enough for most users. Nearby is a 3.5mm audio output, a 12V trigger for adding it to custom home theater control systems, and a USB slot that's for firmware updates only. Sadly the remote control is small and cheap-looking, with poorly placed buttons. However, it's responsive and is back-lights in blue light for five seconds or so whenever you touch it, which is useful if you're watching it at night. Modern consumer electronics products are all about the user interface ... but somebody forgot to tell the projector industry. Inside the HD142X are some rudimentary menu systems that belong in the last century, though in practice it's relatively simple to get going. Able to project an image sized at 28 inches (from 32ft.) to a whopping 305 inches (from 32ft. ), the HD142X uses a manual zoom lever and keystone correction to get the image dead-on. We're not a huge fan of that latter tech, because of the image distortion it creates (a manual lens shift lever and a zoom are much easier and more accurate), but with the HD142X we managed to quickly create an image whose geometry we were happy with. Picture presets include Cinema, Bright, Vivid, Gaming, sRGB and Reference (making possible a professional ISF calibration), and for those who want to stretch the quoted 8,000 hours lamp life even further, the bulb can be set to fire in Bright, Eco and Dynamic modes. The HD142X is all about quiet brightness. Don't underestimate how useful is to have a projector that can be used at any time of day, and at the HD142X's low price, its 3,000 ANSI Lumens is a good value feature. However, the HD142X manages to perform a neat trick by pumping out enough light while its fan remains reasonably quiet. In our test the HD142X never got louder than 65dB, and we have no problem sitting close by. Use it in the daytime in Bright mode, and the HD142X creates bright images that are perfectly watchable, and whose colors are only slightly overcooked. Straight out of the box, the Cinema picture preset – which uses less than half of the lumens this projector is capable of – offers up contrasty images in a blackout, as you might expect from a DLP projector. While watching Rogue One: A Star Wars Story from a Blu-ray player, we noticed a surprising amount of shadow detail in black areas of the image, which looks clean and sharp all the way around the image. Color is accurate, well saturated and natural-looking, and though we did notice rainbows from the color wheel, whether you do or not will depend entirely on how susceptible your eyes are (many people never, ever notice it). As a bonus – or perhaps a pointless distraction – the HD142X also deals in 3D, but we were not supplied with a pair of IR-based 3D shutter glasses for this review and couldn't put it through its paces there. From a more practical point of view, having a built-in speaker should be an absolute boon. Sadly the HD142X's 10W mono speaker is something of a token effort, with muffled sound that lacks any clarity. On both voice and music it narrows the soundstage, and lacks any kind of low-frequency action. So that speaker is a waste of time, right? Strictly speaking, yes, but the accompanying audio output on the rear of the HD142X means you can plug a pair of headphones in without getting any amplifiers or other audio equipment involved. It's extra effort, but it'll be well worth it in the end. The HD142X is not an exciting projector. Take the 8,000 hour lamp life guarantee. It's not much fun, but it will save you some trouble in a few years. Nor is there anything particularly special about its Full HD resolution, while its 10W integrated speaker could be better. However, taken as a package, there's little the HD142X can't do well. Though you might expect excellent color and contrast from a projector these days, the HD142X performs well with both straight out of the box, which is rare. Expect clean, crisp images with plenty of accurate color, and more contrast and shadow detail within black areas of the image that you've a right to expect at this price. And we loved the brightness of the lamp, which meant we could use the HD142X at midday and still see the image clearly. This is a single-chip DLP projector, so of course it does come with the slight irritation – to some (not all) eyes – of DLP rainbow effect, so those who are susceptible should avoid it. The two HDMI inputs are going to be fine for most users, but for those wanting to set-up the permanently with a games console, a Blu-ray player and a set-top box of some kind, a third would have been nice. It would also be great to see a wider use among projector manufacturers of a manual lens shift lever, which makes the a projector easier to aim, and which the HD142X notably lacks. The HD142X also has a poor remote control and a dated, boxy design. Versatile and with plenty of core technical quality, the HD142X is a highly impressive proposition for the money. Aside from its whopping 8,000 hour lamp life, there's nothing groundbreaking here, and the fact that it offers only a Full HD resolution may disappoint some. However, forget 4K resolution – that's not coming to a projector of this price for a good few years yet – and bask in the HD142X's big, sharp images, its impressive contrast and shadow detail, and, above all, its irresistible ease of use. Long story short, if you're after a projector that you can take out of a cupboard for the occasional big screen movie or gaming night, the compact, versatile and great value HD142X is hard to beat.